The best online photo printing services are capable of producing results comparable to traditional brick-and-mortar pro photo labs. 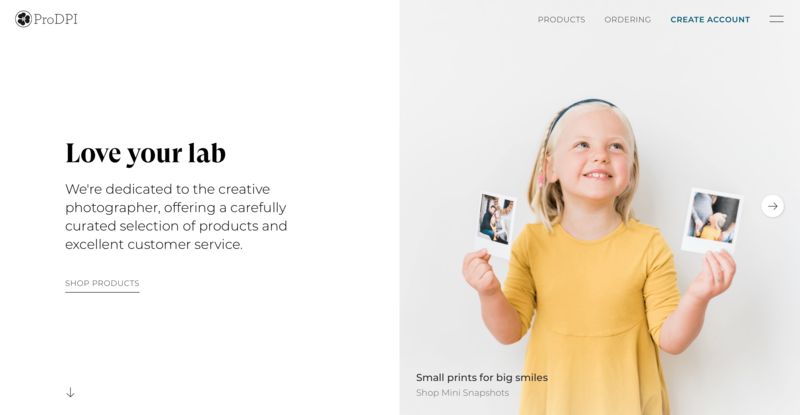 However, although many companies are offering online photo printing, most are geared towards printing 4×6″ family vacation snaps rather than producing high quality, large format prints for art photographers. Indeed, amidst all the commercial labs and fly-by-night companies aggressively pushing their services on the web, good online printers can be hard to find. 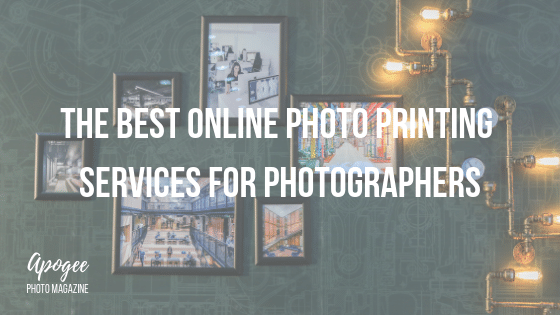 For this reason, we’ve put together a list of some of the best online photo printing companies for serious photography enthusiasts, and a short guide explaining how to get the most out of their services. Google the phrase “best online photo printing,” and you’ll find endless 10-best-style articles listing familiar names like Walgreens and a few other more dedicated, but still decidedly cheap and cheerful, photo printing services. These companies might be fine for quickly printing off your phone’s camera roll, or placing large orders of multiple photos (for example, to send to all the guests of a wedding), but they are more about offering a fast, low-priced service for the average consumer than catering to true photographic aficionados. But as a serious photographer, you’ve likely gone to a considerable amount of effort to shoot the best photos you possibly can. This being the case, it makes no sense to entrust your precious photos to some mass-market lab churning out prints on an industrial scale with little care for quality or color matching. Your artistic endeavors deserve much more than this. Of course, in an ideal world, you would develop a good long term working relationship with a local photo printing lab, one that is willing to take the time to get to know your work and to understand your particular requirements. Indeed, beyond learning to make your own prints, working together with a knowledgeable professional printer is the only way to guarantee excellent results every time. What’s more, feedback and advice from an experienced printer can often help you to improve technically as a photographer, so that your images will print even better next time. Depending on where you live though, working with a local photo lab may not be possible. In which case an online photo printing company will likely be the only real option open to you. But this doesn’t mean you should be forced to accept substandard printing or poor service. It does mean that to ensure that your prints come back just as you expected, you’ll need to do some serious research into which are the best online printing services and to take a few precautions of your own before uploading your files. This guide will explain exactly how. How to Get the Best out of an Online Photo Printing Service? Finding a competent photo printing lab is half of the job (we’ll recommend some of the best online photo printing services in a short while). But there’s still quite a lot that you can do as a customer to help guarantee that the results are up to your expectations. In this short guide, we’ll make some suggestions on how to prepare your image files to reduce the risk of disappointment when working with online photo printing services. It goes without saying that if your photos don’t look great before you send them for printing, they are hardly likely to look all that good when they come back as prints either. Although a very slightly out of focus or blurred image might look fine when viewed on your monitor, even quite minor errors can stick out like a sore thumb once enlarged as a print. Zoom into your selected photos and carefully check that there are no imperfections that need to be removed or problems to be fixed. If an important part of an image – say the subject’s eyes – is a little bit out of focus, the photo can sometimes be saved by the subtle use of Photoshop’s Unsharpen Mask. Be extra careful with any strong areas of color within an image, particularly if these areas lack much detail or information beyond color itself. Although they might look fine on your monitor, some colors may suddenly become super-saturated when printed. Depending on the type of paper and printing technique used, red, cyan, blue, magenta, and green are all particularly prone to printing much stronger than expected. Finally, it’s worth bearing in mind that a print has a much-reduced color gamut when compared with a digital file viewed on a top-end monitor. This means that inevitably there will be a certain degree of reduction in the depth and range of information present in an image once printed. Thankfully, you can help to limit the extent of this data loss by editing your files with this problem in mind right from the start. Typically it is the shadow areas of an image that most suffer from this problem. By lightening the image very slightly overall, but particularly in the shadows, you increase the chances of important shadow information still being visible in the final print. Unless you are specifically told differently by the printer, save your images as TIFF files using the Adobe RGB 1998 color profile. This will reduce the risk of your photos undergoing any significant shifts in color between when you finish editing them and the moment they come off the printer. Adobe RGB 1998 is a reasonably wide gamut color space that is commonly used by many photographic printers. By already saving your files using this profile it’s much less likely that anyone will need to convert them from one color space to another – a process that can sometimes cause the colors of an image to change. Note that although we recommended saving your files as uncompressed TIFF files whenever possible, to save on bandwidth some online printing services only accept JPEG files. If in doubt check the printer’s requirements. It almost goes without saying that small, low-resolution files will not make for good enlargements. So unless you’re deliberately going for a trashy pixelated look, be sure to provide the printers with images of sufficiently high resolution for printing (usually a minimum of 300 ppi) and the correct dimensions for your chosen size of print. When it comes to ordering prints online, there are already enough variables in play that you don’t need to go making things even more complicated by using the wrong kind of monitor for editing your photos. If you are not using a high quality, wide gamut IPS panel monitor, don’t be surprised if your prints come back looking different from how you expected. See our guide to the best monitors for photo editing for more info on this subject. Even if you are using a good photo editing monitor, monitors generally tend to be overly bright. Meanwhile, as we already mentioned above, photos often lose a degree of shadow info once printed. Before saving the final version of your image for printing, lower the brightness of your monitor to halfway and see if it still looks good. If not, you may need to brighten up the image even further. If you don’t have an appropriate monitor for photo editing, it can be helpful to view your files on several other monitors/devices before you upload them for printing. This way you can at least check if there are any major differences in color, contrast or density when viewed elsewhere. Photoshop comes with a function allowing you to visualize how a file will look when printed: a process known as “softproofing.” This simulates how the colors of an image will change depending on the type of printer and paper used. To do this, go to View > Proof Colors. This function will only be of genuine use if you know precisely what kind of printer and paper your chosen online photo printing lab will be using. The best online photo printing companies will list this information on their website. Most do not. If you have access to a home printer, it might also be worth making actual physical proofs of your selected photos before ordering enlargements. Although there’s no guarantee that the results of your DIY tests will be at all similar to those of an online printing service, making small-format test prints might reveal any issues with density, color, or contrast ahead of time, allowing you to fix them before sending your files to be printed professionally. By default, some online printing services make corrections to the color balance of their clients’ files before printing. While this service might be useful for inexperienced photographers – who either aren’t conscious of the problem of color casts, or just don’t know how to correct them themselves – it’s clearly of no interest to more advanced photographers who’ve already gone to considerable trouble to get the colors of their photos looking exactly how they want them. Be sure to deselect any color correction options (or to select the “do not color correct” option) when uploading your files to an online printer’s website. Otherwise, the print shop may take it upon themselves to neutralize your beautiful warm golden-hour tones and all your careful color work will have been in vain. Some of the best online printing platforms provide a text box when uploading, allowing you to add any specific instructions for printing. This is a good opportunity to clarify your requirements and make any special requests. For example, you might have spent hours working on your photos in post-production to give them a clean, bright, and airy quality by opening up the highlights and midtones. If this were the case, you would not be happy if an online printer mistook this effect for an error caused by an uncalibrated monitor, and consequently decided to darken your photos to compensate. If there is anything about your photos that is out of the ordinary, now’s the time to speak up. However, if you do add some instructions here, try to be as clear and concise as you can, otherwise, there’s the risk that nobody bothers reading them. Now that you’ve gone to all the hard work of preparing your files as best you can, you will want to be sure that you’re entrusting them into safe hands. But what should you look for when deciding which is the best online photo printing service to use? While online reviews can be helpful, they are notoriously prone to being gamed by the companies that review themselves. 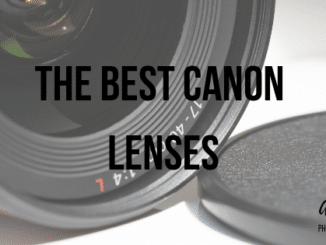 They are certainly are no substitute for true word of mouth recommendations from satisfied photographers you know personally. If you don’t know too many other photographers, this can make it hard to find a good printer. However, there are several cues you can look to when deciding which are likely to be the best online photo printing services for good quality enlargements. Let’s take a look at some of the mains ones. Labs catering to the commercial photography world tend to use lightjet printers (look for paper types such as Fuji Crystal Archive). While these printers can produce great prints, most photos you see displayed in galleries and museums are produced using inkjet printers. If an online photo printing company offers inkjet prints, it will probably be more focused on the art side of things than weddings and baby photos. Therefore color accuracy is likely to be more of a priority. The best online photo printing services will offer a wide range of paper types and finishes. Ones that print using Hahnemühle papers are likely to be even better still, although there are of course many other very good inkjet paper brands (and arguably some that are even better than Hahnemühle). When it comes to inkjet printing labs – who will use large-scale “plotter-type” roll-paper printers – there’s very little reason why you can’t order any print dimensions you want (up to a point). The printer will lay out your photos together with other clients’ work in such a way as to maximize paper usage, and a certain amount of waste will be calculated into their prices. Meanwhile, standard print sizes are often a sign of a standardized, one-size-fits-all process. Not what you want if you can avoid it. A company putting too much emphasis on greeting cards, gift boxes, printed mugs, and key-fobs – rather than on good quality photographic prints – is likely to be a less serious proposition. Such printers will make the bulk of their money from producing these novelty items, and therefore they don’t really need to go to the effort of acquiring all the skill and technical know-how required to produce stunning art prints. Although it’s by no means a foolproof sign, if an online printing platform’s web design looks cheap and trashy, then the quality of its printing may be of similarly low quality. After all, if they can’t even manage their image properly, you can’t realistically expect them to look after your images all that well either. It may seem obvious, but websites that look like wedding photography studios – all pastel colors and prettiness – most likely cater to wedding photographers: en entirely respectable area of photography, but not one where color accuracy is the number one priority. Meanwhile, websites that look like precision pro photo labs are more likely to be precisely that. If you’re looking for a quality fine art print, go for the latter rather than the former. It’s worth stressing that none of the above points are surefire ways of telling who is and is not offering a serious printing service, but if an online photo printing site you are considering using fails on a majority of these points, you should probably look elsewhere. Over the last decade or so a high number of websites have appeared offering online photo printing services. Just google “best online photo printing,” and you’ll see all of the options. However, many of these companies are perhaps better at online marketing than actually delivering the services they claim to excel at. 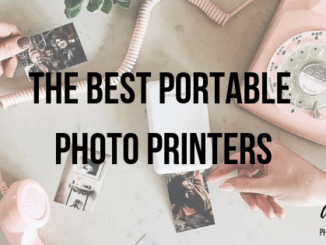 Others may be perfectly respectable and produce good quality prints, but if their services are limited to small-sized multiples then they are not really relevant to the scope of this article, and therefore we haven’t included them in our list of the best online photo printers. We’ve also left out any companies producing large-scale prints, but only on canvas rather than photographic paper. This is because the primary business of such companies is producing “art prints” for interior design purposes. Therefore it seems unlikely that color accuracy and print sharpness will be high on their list of priorities. In any case, with its dominant texture, a canvas is an unsuitable material for enjoying the full quality of a high-resolution photograph. With that said then, if you’re looking to make good quality mid- to large-scale prints of your images – say for an exhibition or to display in a portfolio – then these are our recommendations of some of the very best online photo printing services currently out there. Although this company is geared more towards commercial photographers ordering albums and books for wedding, newborn and graduation photography clients, ProDPI is a professional online printing service. They offer everything from portfolio prints to large scale wall art so it can be a good option for fine art photographic printing, too. Reflecting the company’s more commercial photography focus, many products are printed on Fuji or Kodak lightjet paper. However, ProDPI also offers fine art printing services using archival inkjet technologies on 100% cotton rag papers – which is what we would generally recommend for more artistic results. Mounting, framing, and dropshipping services are also available. White House Custom Color (WHCC) is another online printing service largely catering to professional wedding and newborn photographers, but also offering an array of services that will be of interest to photographers shooting everything from portraits to landscapes, travel and still life photography. 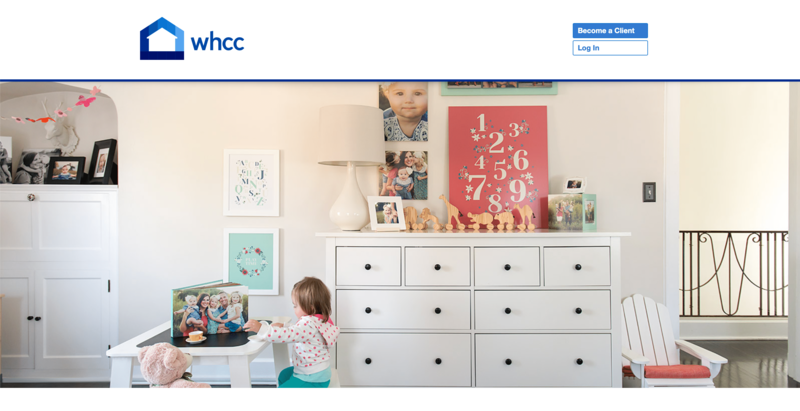 WHCC distinguishes itself as a serious printing service by offering fine art prints using Hahnemühle products: makers of some of the best inkjet photo printing paper in the world. Canvas printing is also available. 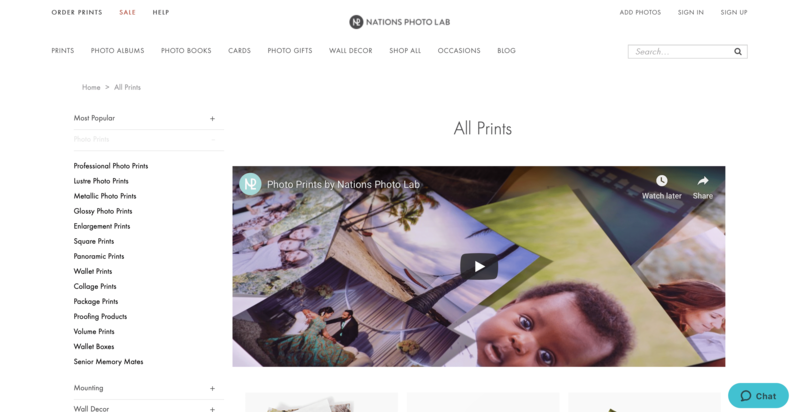 Awarded “Best Online Print Service” by The Wirecutter, Nations Photo Lab offers a wide choice of products and finishes along with the ability to print to your images as photo books and albums. Although Nations is now a company employing 150 full-time employees, it started as a two-man portrait photography business, and the owners themselves are still shooting even today. This can only translate into better service for photographers. As with the majority of online photo printing services, the bulk of Nations’ business comes from graduations, proms and weddings. Accordingly, a large number of options are available for greetings cards, albums, and photo gifts. Standard prints are made with Kodak Professional Endura Premier lightjet paper, rather than more fine art-focused inkjet prints on cotton rag paper. Nations is one of the best online photo printing platforms, so if their services meet your requirements, then you should definitely give them a try. As one of the most frequently recommended online photo printing services, Mpix offers prints up to a maximum size of 24 x 36″ and claims to ship most orders within a day. Photo books, canvas prints, and wall art are also available. However, while quality and service may be very good, the choice of papers is limited to standard commercial-lab lightjet options, with apparently no cotton rag fine art papers on offer. So while Mpix may be one of the overall best online photo printing labs, it doesn’t top our list due to the lack of options for more serious photographers. Still, service is apparently very fast, and efficient and prices are competitive. For those that prefer lightjet printing to inkjet, Mpix is undoubtedly one of the better options. Miller’s is a serious photographic lab with a history of providing services to the commercial and fine art photographic industries running back 70 years or so. 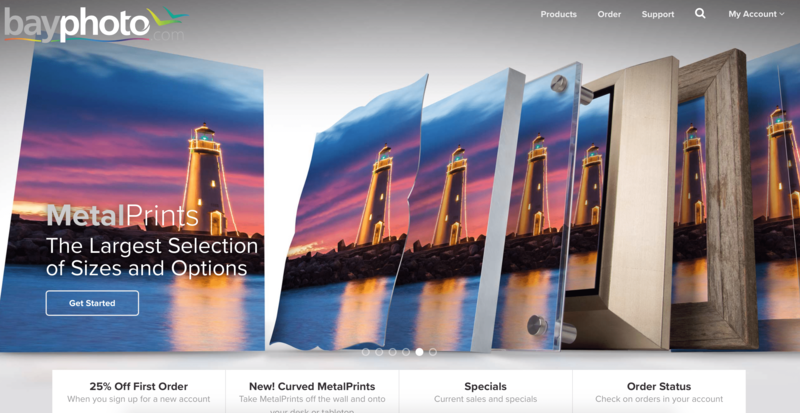 Having fully adapted to the digital age, Miller’s now offers an online photo printing service. Indeed Miller’s is also the company behind the hugely popular online printing website Mpix (above). Papers offered include the standard Fuji Crystal Archive lightjet papers to high-GSM matte fine art options. Offering “useful” facts such as the number of smoothies their staff has consumed (1,100), and furnishing their Las Vegas and Ottawa production studios with ping pong tables and “inspiring” slogans such as “make art not war,” CanvasPop is the hipster startup of the online photo printing world. 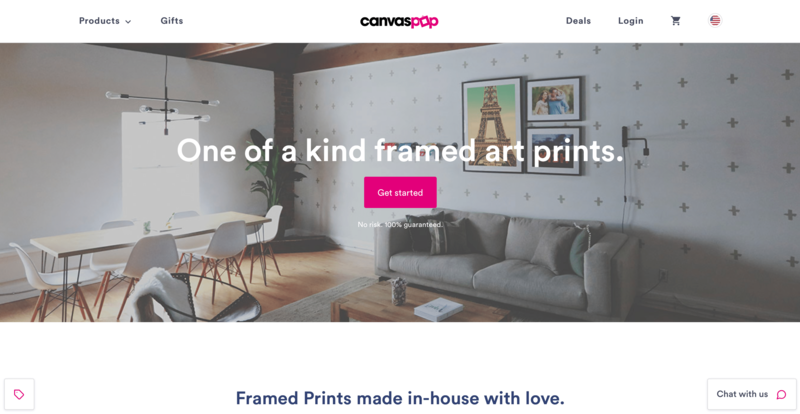 Cynicism aside though, CanvasPop’s dedicated “art print” services are recommended by many. The company also offers the possibility to print your photos on everything from large-scale canvases to fridge magnets and pillows. Based near Santa Cruz, CA, Bay Photo is another long-established pro-photo lab that has successfully made the transition to the digital world. Prints are available in sizes “from wallets to 30 x 120” – meaning that you have an enormous range of dimensions to choose from. Also, the good news for photographers doing their own color management is that Bay Photo’s “economy” printing – without color correction – typically costs around 30-50% less than the fully color-corrected service. Ultimately there’s no substitute for working with a dedicated local photography lab, especially one where staff is willing to put in the effort to learn about your photographic needs and develop a good working relationship with you over time. However, if you are prepared to do some extra prep-work on your images beforehand, the best online photo printing services may get you pretty close. Good file preparation means taking into account some of the limitations of photographic printing in general, and online printing services more specifically, to increase the likelihood that your photos are delivered to your door printed just as you wanted. If you are willing to put in the little extra time and energy that this involves, then you will likely be quite satisfied with the final results. And if for some reason you’re not, then at least you can be pretty confident that fault lies with the lab rather than with your file preparation. Nonetheless, if you are working in more artistic areas of photography such as landscapes, travel, and portraiture, we would still recommend entrusting your printing work to a smaller, dedicated photographic printing lab. While you may not be fortunate enough to live close to such a lab, it’s worth bearing in mind that most will be happy to take orders from further afield. So although a traditional brick-and-mortar photo lab may not offer a dedicated, streamlined user interface for uploading files and selecting print options, many will nonetheless be happy to accept your files via FTP or through cloud services such as Dropbox or WeTransfer. You can then provide any specific instructions via email or over the phone: which is ultimately likely to be a much more personal and satisfactory method of communicating your needs than selecting some preset options on an automated uploading platform. A more personal service may cost a little more, but the final outcome usually justifies the extra expense. So although the best online photo printing services will certainly do a good job of printing your photos, for truly excellent results you need to be on first-name terms with the person printing your work: a relationship that’s difficult to cultivate by means of a digital user interface.